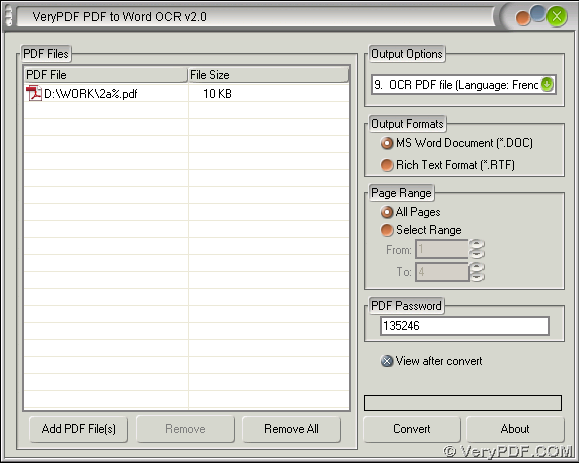 If your scanned PDF file contains open password and you want to convert this encrypted PDF to Word file, I think you can use PDF to Word OCR Converter, for this software can help you convert encrypted PDF file to Word file with OCR technology to make conversion more flawlessly without encrypted PDF file opened on your computer. So if you would like to know more details, you can keep reading this article. So till here, this article has nearly come to the end, so if you have some questions on process to convert encrypted PDF to Word with OCR technology, please leave your comments here. If you would like to know more information of PDF to Word OCR Converter, please visit homepage of PDF to Word OCR Converter. How to merge TIFF with OCR to Any Converter? How to convert BMP to Word with OCR to Any Converter? How to convert " secured" PDF to word? This entry was posted in PDF to Word Converter and tagged OCR technology. Bookmark the permalink.